Ugni Blanc exclusively from vines located in the south east of our estate from the plot named “Chez Piet.” The soils there are similar to Grande Champagne, crumbly lime stone with a clay top layer over thick crumbled lime stone. The BNIC (Bureau National Interprofessionnel du Cognac), the governing body in the Cognac region, guarantees the authenticity and trace-ability of the vintage program by monitoring the wax sealed barrels in our cellars. Appearance: Shining, orange color with yellow hues. 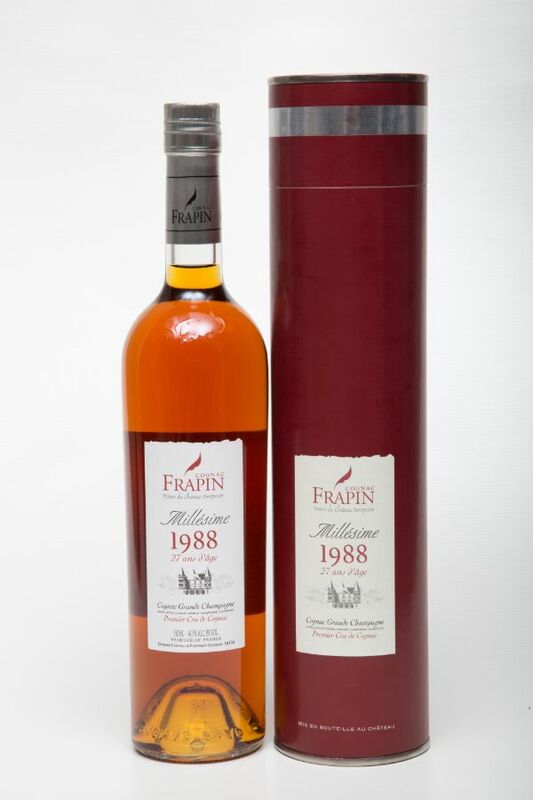 Aroma: Unique and perfect balance of various dry fruit aromas (chestnuts, figs…), plums and dried apricots that are followed by wood aromas, rancio notes, and cigar box typical from an old Grande Champagne cognac. At the end, leather tones underline the typical authenticity of age, time and patience…25 years. Palate: Charming, smooth, creamy with yet a firm structure, showing finesse and complexity. Perfectly matured grapes for the wine, followed by a distillation of fine lees, give this cognac exceptional length and an aftertaste amplified by the long Limousin oak barrel aging. Cellar master’s notes, Patrice Piveteau: The low yield characterized by this vintage, in addition to that year’s warm and dry weather conditions during the final maturation weeks at the end of the summer, allowed for perfect grape maturation. At the end of distillation, this particular lot, characterized by savory aromas in perfect balance and structure, was a natural choice for our vintage program.